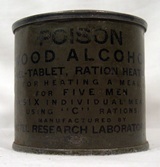 USA tin, paint in the typical color "olive drab", containing solid fuel to heat the military rations. It was part of the american soldiers equipment in the second world war. Never opened, still contains the product. For more information look at the label! Notify me of updates to Ration heating fuel tin.